Or so it was named by the late 19th-century Russians — leave it to them to label a butterfly as such. It’s definitely the first time I’ve ever heard Butterfly and Doom used in the same phrase…. On our hikes, we often stumble upon areas of flurried butterfly activity, due to Florida’s abundant all-year blooms. 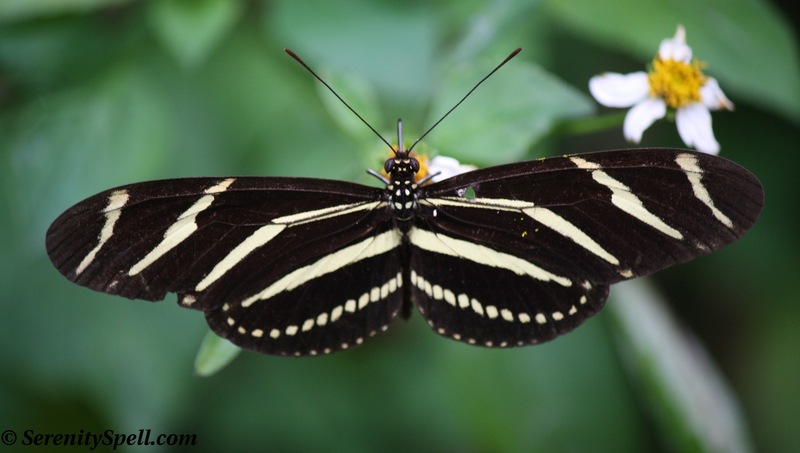 The most common encounter is the Zebra Longwing (Heliconius charitonius), found throughout the hardwood hammocks, swamps, and Everglades — and designated the official state butterfly of Florida in 1996. I rely on our natural environs for butterfly shots, and we’ve spied some lovelies — swallowtails, sulphurs, whites, milkweeds, and longwings — but more often than not, they don’t want to pose for the camera. I find myself plowing through beastly (but harmless) banana spider webs, or carefully winding through swamp, to chase butterflies. But I was lucky with this guy, so much so that I thought he was a moth — especially when I observed his antennae from afar. Obviously they’re long enough to be classified as a butterfly, because that’s what he is — specifically, a Red Admiral (Vanessa atalanta). Found in North America, Asia, and Europe, territorial males can be found in the same location day-to-day — and as a testament, the images below were shot on separate days, in the same clump of foliage. 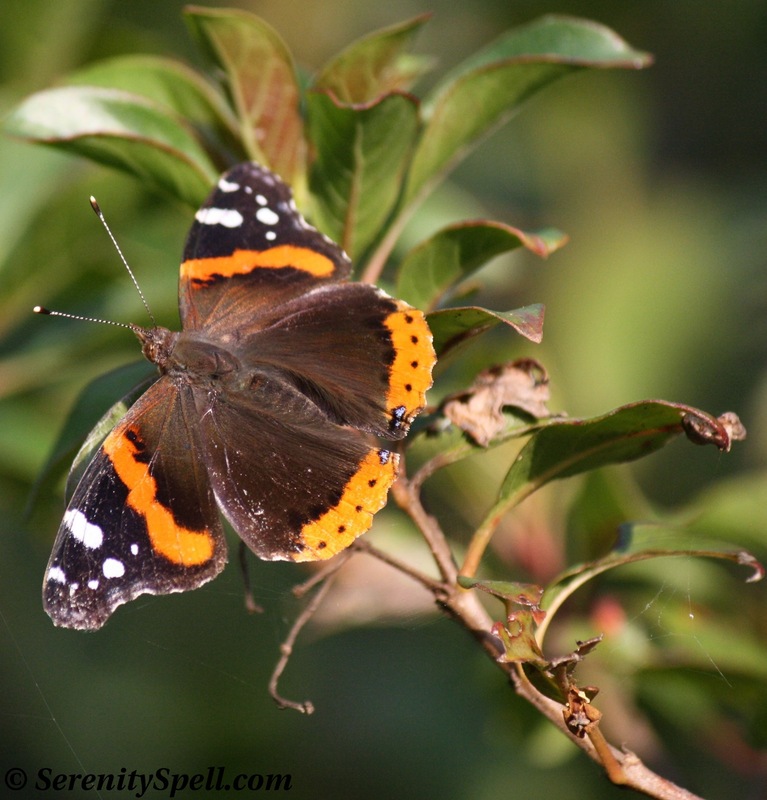 Red Admirals are dark brown, with brick-red bars and white markings on the tips of the forewings. Although known to be quick fliers, they’re also considered a docile butterfly — a perfect companion for gardens, being very people-friendly, and known to perch on humans. It would explain my ideal photographing opportunity (read: no spiderweb activity)…. The Red Admiral is considered the favorite butterfly of author and amateur lepidopterist Vladimir Nabokov (1899 – 1977); it’s mentioned throughout his writings, taking a prominent role in the 1962 novel Pale Fire. When scholar Alfred Appel, Jr., asked why he was so fond of Vanessa atalanta, Nabokov replied: “Its coloring is quite splendid and I liked it very much in my youth. Great numbers of them migrated from Africa to Northern Russia, where it was called ‘The Butterfly of Doom’ because it first appeared in 1881, the year Tsar Alexander II was assassinated, and the markings on the underside of its two hind wings seem to read ‘1881’. There is something interesting in the Red Admirable’s ability to travel so far” (Strong Opinions, p. 170). ← Red-winged Blackbirds… And Their Babies! 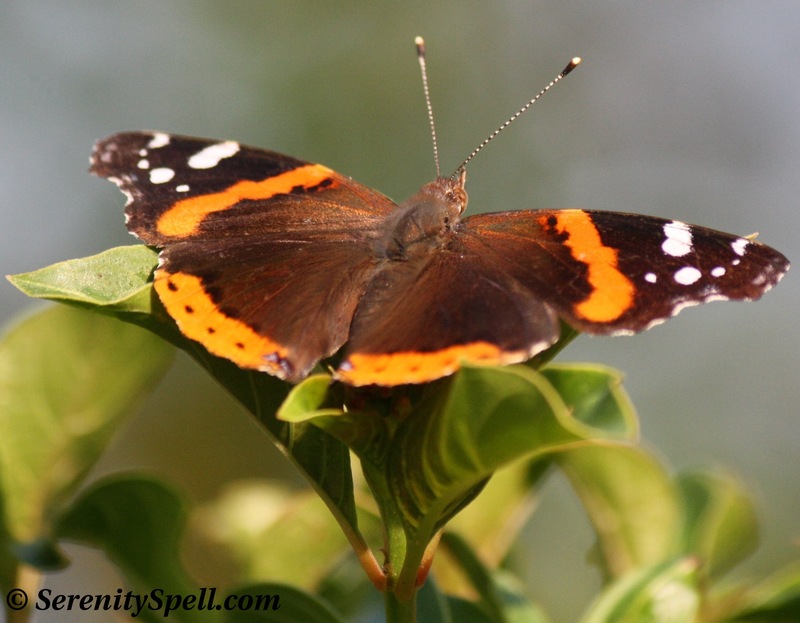 I love Red Admirals, and the photography… beautiful! (Puts my phone camera to shame… I cannot find my digital one anywhere….. I think we might have borrowers)! Thanks so much! Heh, I know your situation…. Sometimes I start to wonder the status (human?!?) of these borrowers. But honestly, I’ve seen some pretty amazing phone images! Admirable! Like the blend of image and poetry. And butterflies are tough to pose. The butterflies look really large in the pictures. What a trick! Excellent pictures, so clear & coloured. I love butterflies. It’s still too early for them here with all this rain. Last summer we also experienced cold, wet weather and I did not see many butterflies, plenty of dragonflies, but no butterflies. Utterly superb. I’m following. Like I need another blog to follow — but yours is a must. Thank you! You’re incredibly kind…. Thanks so much! I’m lucky to be surrounded with an amazing beauty here. all I can say it my experience is living testament to Red Admirals being people-friendly, lighting on humans and returning regularly to the same spot night after night. 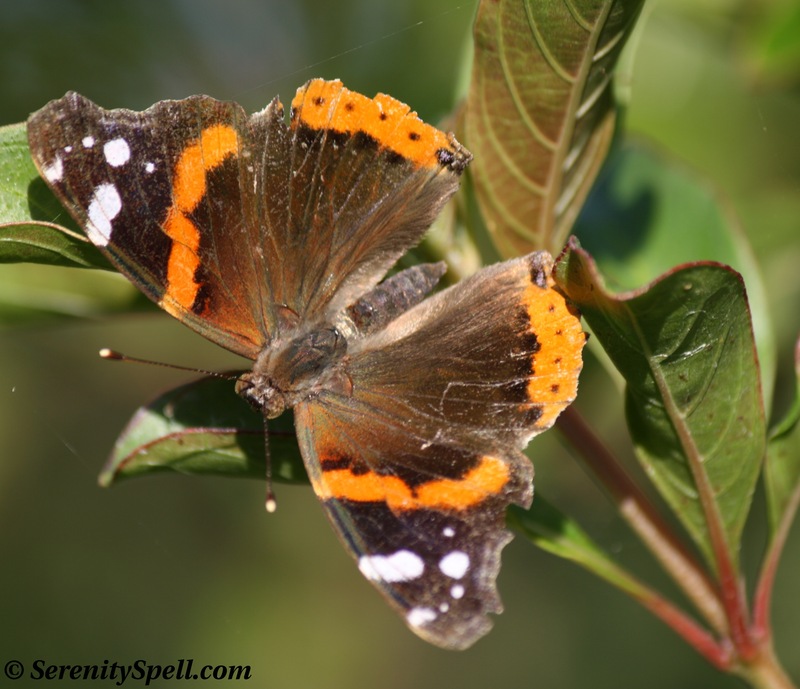 Each summer, Since 2011, we have a Red Admiral returning nightly to our patio in the backyard….from about 7:15 to 9pm….He soars, plays with a companion Red Admiral sometimes, lands on shoulders, flower petals, human backs, blades of grass, fronds, patio furniture, etc. and sits for minutes on one of the objects above as if he(she) is listening. taking in everything you say and do! I am NOT crazy. We had a reporter two years ago, do a feature story in the Louisville Courier-Journal…bearing this phenomenon out! IT is truly an incredible supernatural event…It all started on the anniversary of my deceased sister’s birthday four years ago! We’d like to think it is her spirit returning (she was a professional ballerina)….and just tonight…the eve of my birthday (July 7th) the butterflies (3 in all) were especially active …out later than usual and longer…and attempted several lands on our bodies! Oh, what a BEAUTIFUL story / thing to have in your world! I’ve read much about how these guys, this particular species, is “people-friendly.” So to nickname it the “butterfly of doom” is just…perfect. What a lovely story — I’m so sorry for the passing of your sister, but I too believe in signs throughout nature, incredibly so! And what more beautiful, graceful a sign for her than a butterfly? !